the hose used on the K-9 Dryers and built to last. 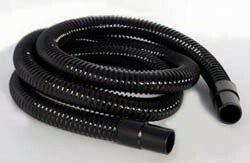 factory bonded to each end of the hose. compared to the old stiffer heavyweight hoses. no pop-offs from the dryer. and even Romani dryers requiring 1 1/2"
Increase air velocity, for only $10.75.